There's a discount for you at the end of the post. Autumn has definitely arrived here in Cornwall. Although we've had some beautiful sunny days, the temperatures have dropped a lot. 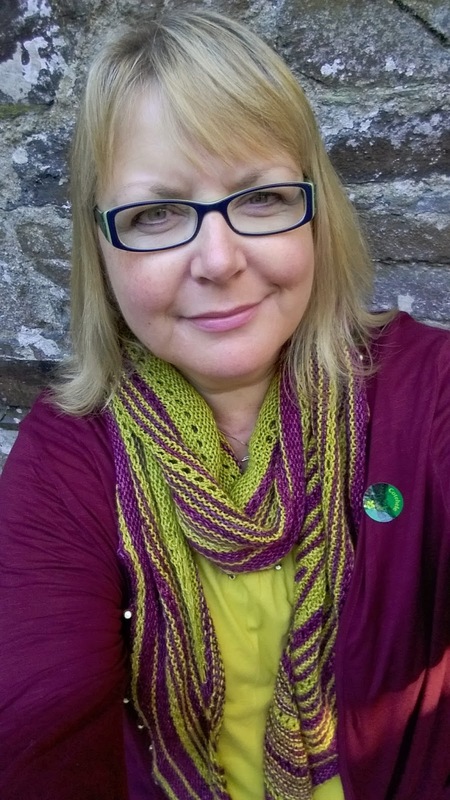 I do miss summer already, but I'm enjoying being able to wear my shawls and scarves again. 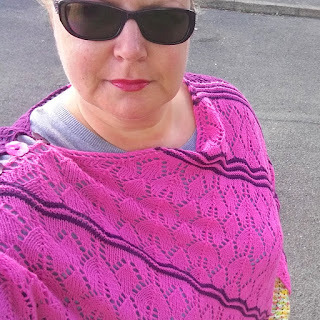 I knit a lot of shawls and I do try to wear as many of them as I can. Do you wear what you knit? A couple of weeks ago the shawl choice of the day was St Aubin's Bay because it matched my t-shirt and cardigan. It's also a really nice shawl to wear as a scarf. By the way, I'm teaching St Aubin's Bay as a project workshop at La Mercerie, Wales, in November. If you're interested in joining me, contact the shop for full details and to book. A couple of days ago, I wore my Portofino poncho when I walked the dog. I did wear a rather colourful pair of handwarmers as well. You can just about spot a glimps of them in the bottom right hand corner. They didn't quite match my poncho but my hands were cold so I didn't care. 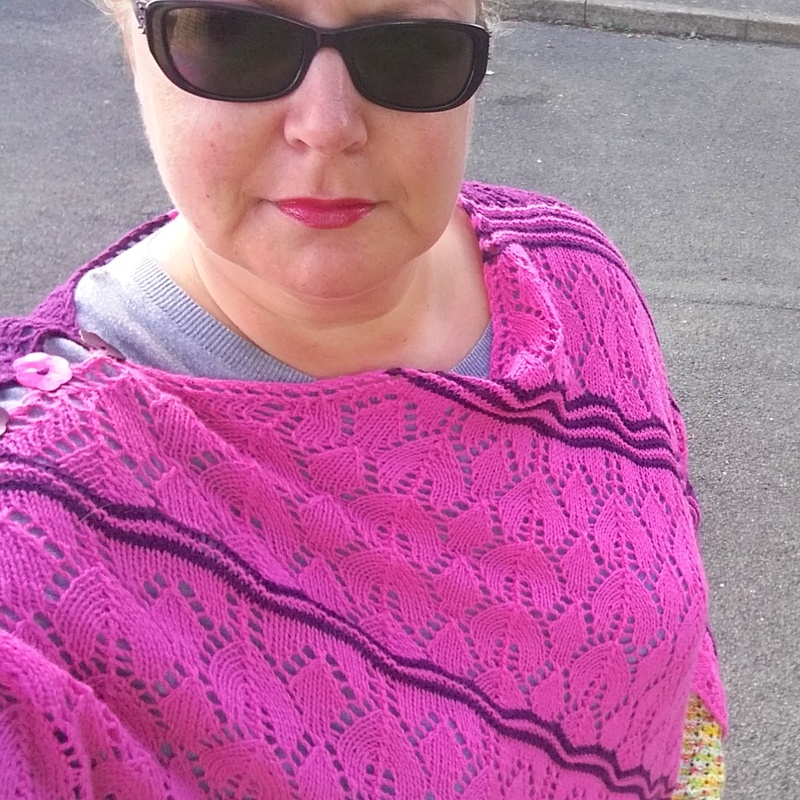 Yesterday, I wore my Carlyon Bay in the morning when I ran errands in town and went to the knitting group. 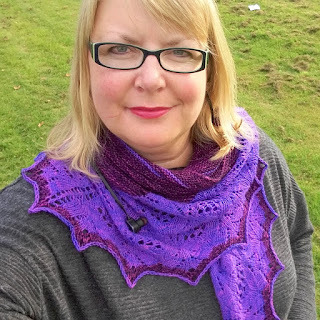 And in the afternoon I changed to Capri which is a large shawl but I bunched it up around my neck to keep warm. There was a particularly chilly wind yesterday. This week is Woolweek in the UK, and to celebrate I'm offering 3 for 2 on all my patterns. All you need to do is to choose 3 patterns from my Ravelry Pattern Shop (you don't need to be a member to purchase) and add the code: woolweek and the cheapest pattern will be free. The discount ends on Sunday 16 October.